The most unique aspect of Northern Norway is its wild and beautiful landscape, and the Lofoten archipelago is considered to be the most spectacular of all. A distinctive landscape of precipitous mountains and sharp peaks combine with sheltered bays, white sand beaches and traditional fishing communities to form a backdrop that once seen, is never forgotten. On arrival at Leknes airport, collect your hire car and drive to the south-western tip of the Lofoten archipelago and the village of Reine. Overnight at the Reine Rorbuer, The Lofoten Islands. Day at leisure. Opportunity to explore the southern islands of the archipelago: Moskenes and Flakstad. At every turn the mountainous peaks and picturesque ports of the Lofoten beg to be photographed. It is easy to see why so many artists have been drawn to these magnificent isles. The light here is very special and only enhances the splendour of this awe-inspiring scene. Take a cruise on the Reinefjord (Jun- Aug) to the village of Vindstad and then continue your journey on foot to the beach at Bunesstranda (1-hour each way). A national tourist route (scenic drive) has been developed in the Lofoten, linking the village of Å to Raftsundet in the north. The Lofoten archipelago is blessed with some of the most spectacular scenery in Norway: craggy alpine peaks, glistening white sandy beaches, fishing hamlets and verdant agricultural communities. Today, take a leisurely drive through this diverse landscape, along the tourist route, on your way to Svolvaer. Overnight at the Svinoya Rorbuer, The Lofoten Islands. Day at leisure. Opportunity to explore the islands of Vestvågøy and Austågøya. In particular we would recommend a visit to the Viking museum at Borg, home to the largest-known Viking chieftain’s house. During the summer months, the sun continues to bathe the mountains and fjords in a golden glow at midnight. The beach of Eggum on the island of Vestvågøy is one of the best spots from which to observe the natural phenomenon. The village of Henningsvaer, situated at the foot of Mount Vågakaillen, has more than its fair share of art galleries, handicraft shops and workshops and is worthy of a visit. From Henningsvaer, it is possible to participate in a Midnight Sun safari (23 May – 24 Jul), snorkelling trip (15 Jun – 15 Aug) and a sea eagle excursion (15 Jun – 15 Aug). Overnight at Svinoya Rorbuer, The Lofoten Islands. Time to explore the port town of Svolvaer or take a hike in the mountains. Drive to Svolvaer airport for the return flight to the UK. Reine Rorbuer stands at the mouth of the Reinefjord on the south-western tip of the Lofoten archipelago, on the island of Moskenesøy. Reine Rorbuer stands at the mouth of the Reinefjord on the south-western tip of the Lofoten archipelago, on the island of Moskenesøy. Surrounded by blue ocean waters, a vibrant fishing community, and with the majestic summits of the ‘Lofotveggen’ range as its backdrop, this is a truly picturesque setting. 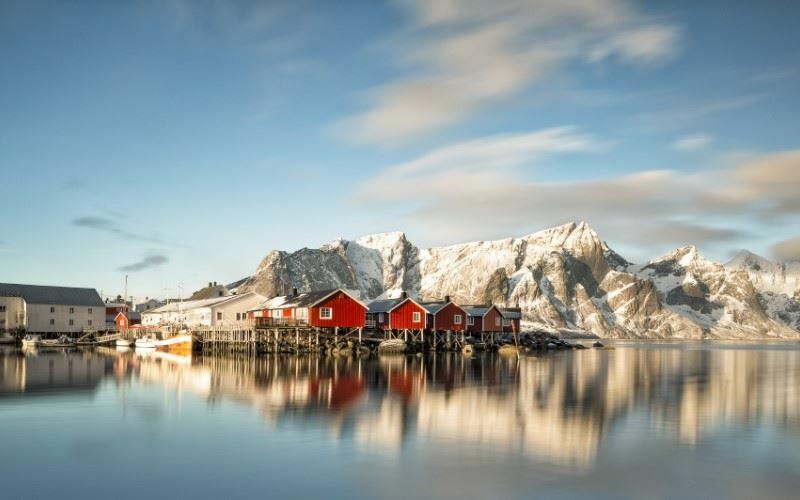 The 36 traditional cabins of Reine Rorbuer, once housing the visiting fishermen during the winter months, have been carefully restored and renovated. The red wooden structures have been warmed with colourful textiles and modern conveniences, whilst the atmosphere of yesteryear has been retained. Most Rorbuer enjoy panoramic water views and some have the added benefit of a private terrace. The standard of cabins varies depending on the date of renovation. Some cabins have been recently renovated. A number of walking trails – marked and unmarked – are available on Moskenesøy. Svinøya Rorbuer is centrally situated in the harbour of Svolvær, a short walk from the centre of this vibrant fishing town. Svinøya Rorbuer is centrally situated in the harbour of Svolvær, a short walk from the centre of this vibrant fishing town. Svinøya is the oldest district of the town and it was here that the first shop was established and where the first trading activities began in 1828. During the early 19th century, a row of cabins were built to accommodate the visiting fishermen during the Lofoten winter cod season. Today, a number of the original cabins are offered by Svinøya Rorbuer as tourist accommodation and considerable emphasis has been placed on maintaining their authenticity. Time-honoured craftsmanship and timber have been preserved in order to provide a feeling of a bygone era. For those looking for a contemporary base from which to explore the spectacular Lofoten Islands, look no further! In addition to the traditional Rorbuer, the Svinøya offers a selection of newly built Rorbuer cabins and Rorbuer suites each enjoying sea views. The furthest cabin is located 200m from the restaurant in Svinøya. 17 Rorbu suites each with 3-bedrooms, 2 bathrooms (shower only), living room with cable TV, complimentary WIFI internet connection and well-equipped kitchenette (four electric hobs, oven, fridge, small freezer, dishwasher, kettle and coffee maker) and a waterfront terrace or balcony. Some suites have the living room on the first floor • The furthest suite is located 200m from the restaurant in Svinøya. A transfer is recommended for clients arriving into Svolvaer by Hurtigruten.